As revealed during an interview with Variety, director Ron Howard took in some words of wisdom from Mr. Lucas himself when it came to a scene between Alden Ehrenreich’s Han and Emilia Clarke’s Qi’ra where Han chose to hang up Qi’ra’s cloak just before some sweet lovin’. So, now you know who to thank when it comes to Han’s slightly messy demeanour – and whether Han cares about the state of your cloak before kissing you. The answer is no. He’s not the only OG Star Wars presence to have an opinion on the Han Solo movie, however. 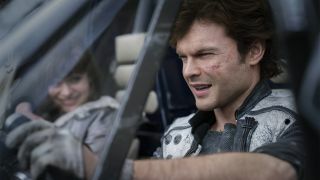 Harrison Ford was “raving” about Alden Ehrenreich’s performance, according to Ron Howard, even going as far to say: “He made it his own.” High praise indeed, and proof that new and old-school can work together, despite being strange bedfellows. For a deeper dive into spoiler territory, check out all there is to know about the Solo: A Star Wars Story ending.